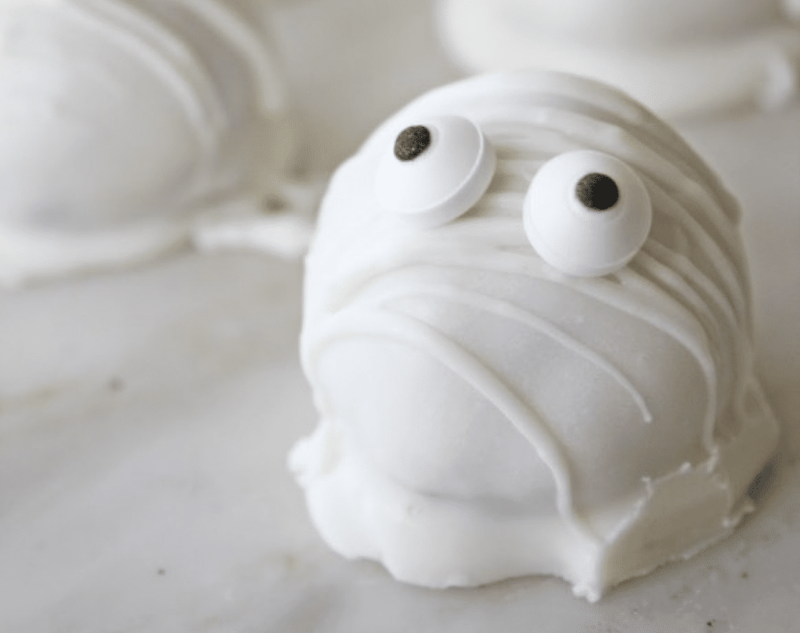 8 Wonderfully Wicked Halloween Treats You Have To Try! Ghost, Ghouls and Goblins, oh my! 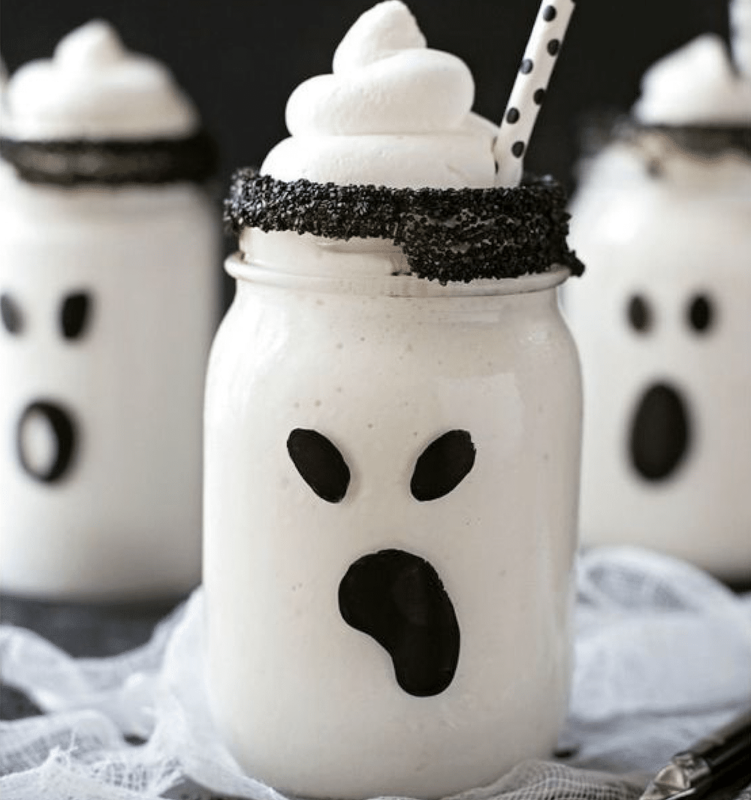 With Halloween less than a week away, rather than share a few DIY projects we found it fitting to share a few of our favorite spooky treats. 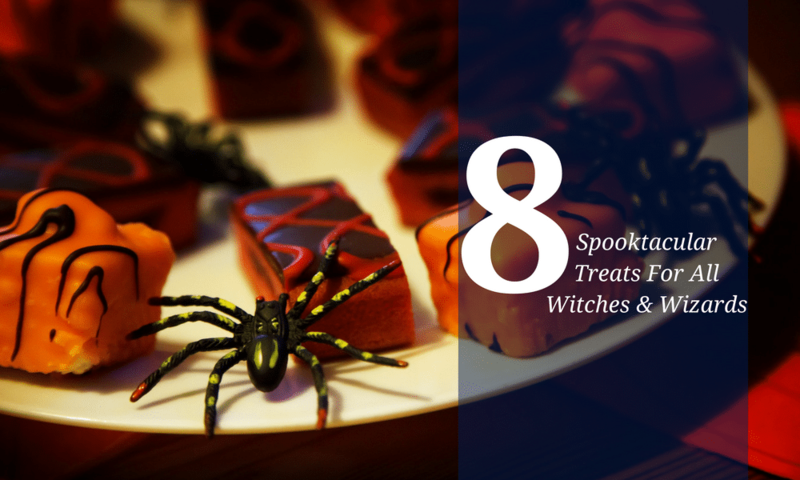 From wicked witches hats to pumpkin rice krispies, these desserts are sure to please any grumbling tummy. In a large pot, melt the butter over low heat. Add the marshmallows and stir until completely melted and combined with the butter. Remove from the heat. Add several drops of yellow food coloring, mix it together, then add red food coloring one drop at a time, mixing as you go. Add red/yellow drops until you reach your desired color. (I used about 4 drops red and 12 drops yellow). Mix well. Add the Rice Krispies and stir to combine. Coat both sides of your hands with a generous amount of cooking oil, and roll the Rice Krispie mixture into small balls. Set on parchment paper. Add oil to your hands after each ball. To view One Little Project’s post, click here. In a blender, combine the ice cream, milk and vanilla extract. Blend until smooth. In a medium size mixing bowl with a hand mixer or in the bowl of a stand mixer, beat the heavy cream, powdered sugar and vanilla extract until stiff peaks form. Divide the milkshake between the glasses. Cut the corner of a large ziplock bag and pipe a swirl on top. Serve immediately. To view Lil Luna’s post, click here. White Decorating Icing – 4.5 lbs. Prepare cake cones. Prepare cake mix following recipe instructions. Place Cupcake Baking Rack on cookie sheet. Insert sugar cones into rack. Fill cones with 2 tablespoons cake batter. Bake and cool cupcakes following package instructions. Decorate cones and cookies. Trim cake to top of cone with knife, if needed. Place cones wide side down on paper towels, along with round cookies. Using black Color Mist, spray cones and cookies black. Let dry, about 10 to 15 minutes. Assemble witch hats. Transfer cones and cookies to parchment paper. Tint 1 cup icing orange. Tint 1 cup icing purple following color combinations provided.Prepare two decorating bags with tip 2B. Fill separately with orange and purple icing. Using orange icing, with smooth side of tip facing out, pipe band around wide end of half the cones. Repeat with purple icing on the other half. 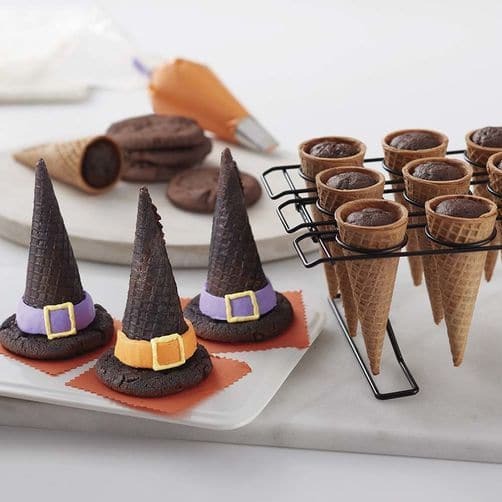 Let set, about 15 to 20 minutes.Pipe small amount of orange or purple icing in middle of cookie; place cone on top of cookie.Tint ¼ cup icing yellow following color combinations provided. Prepare second decorating bag with tip 3 and yellow icing. Pipe buckle around band. *Combine Violet and Rose icing colors for purple color shown. Combine Golden Yellow and Lemon Yellow icing colors for yellow color shown. To view Wilton’s post, click here. Use a small food-safe paintbrush to paint the top of each almond with black gel food coloring. (Wear food-safe gloves if you want to avoid getting your fingertips dyed black as well!) Set aside to dry while you prepare the rest of the recipe. Break or cut each pretzel rod in half. Line a baking sheet with waxed paper or parchment paper. Place the green candy coating in a microwave-safe bowl and microwave in 30-second increments, stirring after every 30 seconds to prevent overheat. Stir and heat until the candy coating is completely melted and smooth. Holding a pretzel rod by the tip, dip it in the green coating until almost all of it is covered, leaving about a 1/2-inch section un-dipped at the top. Continue to dip more pretzels, and while you do, keep an eye on the already-dipped pretzels. When the coating has started to dry, and is mostly matte but not completely hard, it’s time to add the wrinkles for the knuckles. Take a toothpick and hold it perpendicular to the pretzels. Gently roll it across the top to add wrinkles. Make two sets: one set up near the fingernail, and one set about halfway down the finger. This will make your witch finger super realistic! If the coating is too melted and sticky when you try, give it a few more minutes to set before trying again. After all of the pretzels have been dipped and decorated, refrigerate the tray for 10 minutes to set the coating completely. 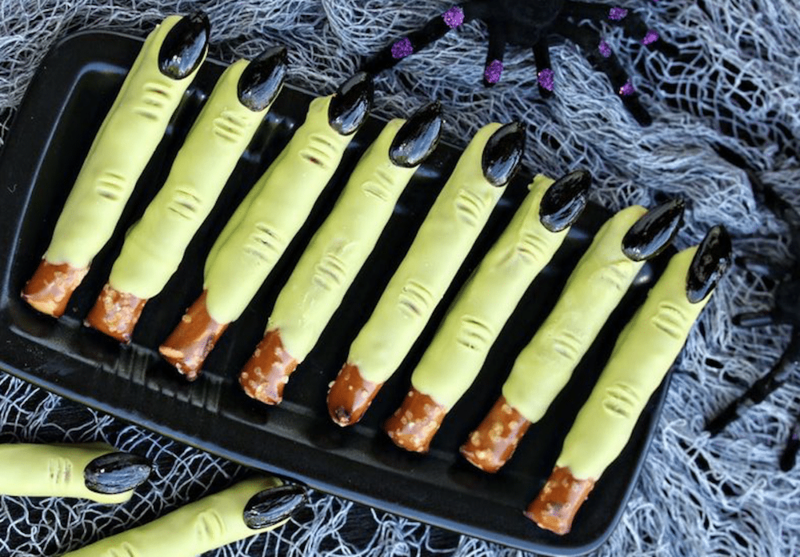 After that, the Witch Fingers can be served, or can be stored in an airtight container at room temperature for up to a month. If you cannot find blanched almonds, you can take whole almonds, with the skins on, and place them in a pan of boiling water for 1 minute. Drain the almonds, let them cool slightly, then pinch the nuts between your fingers—the skins should slip right off. Alternately, if you don’t want to use black food coloring at all, you can use regular almonds or chocolate-dipped almonds instead. To view About Food’s post, click here. First, melt the candy melts in separate bowls in the microwave in 30 second increments, until it is all melted. I like to use small bowls for this treat so it is deep enough for me to drop the marshmallows almost all the way in. Add a tiny bit of coconut oil to the chocolate to make it smooth and easy to work with. I have shared this secret many times before, but it will make any chocolate dipped experience way more pleasant! Dip the marshmallow into the chocolate, leaving a little bit of white at the bottom. Here’s a trick: Stick a toothpick through the bottom to make it super easy to dip the marshmallow without ruining the perfect chocolate shell with your fingers! Picking the marshmallow out of the chocolate is hard with only your hands, trust me this tip will save you a lot of aggravation. Sprinkle the tops with sprinkles and pop em in the fridge for 20 minutes or more. 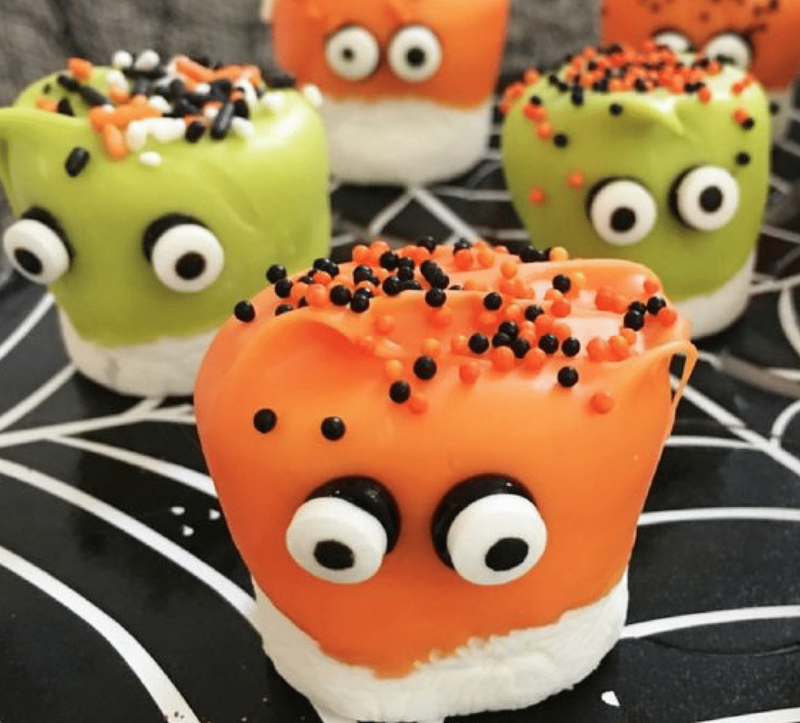 Once they have set, take them out of the fridge and use the gel icing to stick the eyeballs on. If you try to stick them on when the chocolate is still setting they will just slide down and look all sorts of crazy. Put them back in the fridge for 20 minutes to make sure the eyes are good to go and you are done! To view Working Mom Magic’s post, click here. 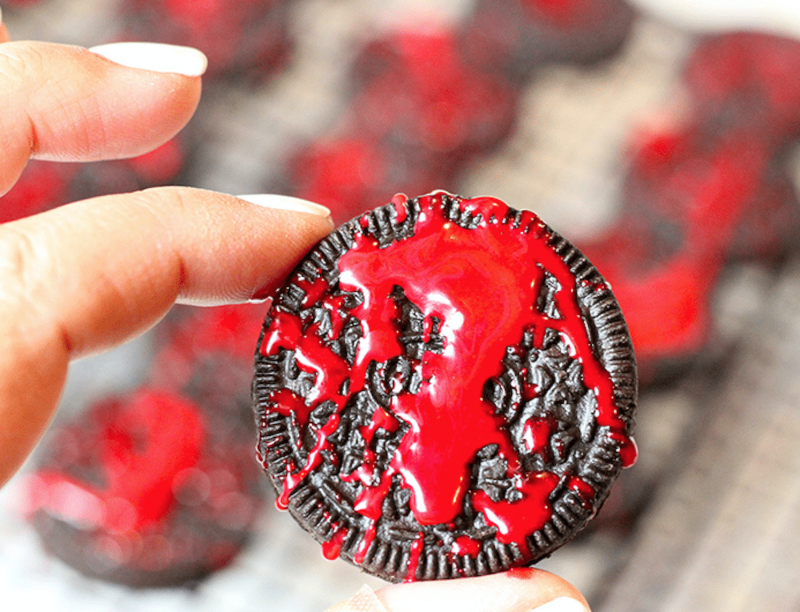 Take your food brush, put some of the cookie icing on it and use it to flick and drip the icing on to the Oreos. Let dry for an hour and you are done! To view Cutefetti’s post, click here. Cream butter, brown sugar, vanilla and sweetened condensed milk together. Add salt and mix. Fold in flour 1 cup at a time. Fold in mini chocolate chips. Chill dough for 1 1⁄2 – ­2 hours. The colder the better. 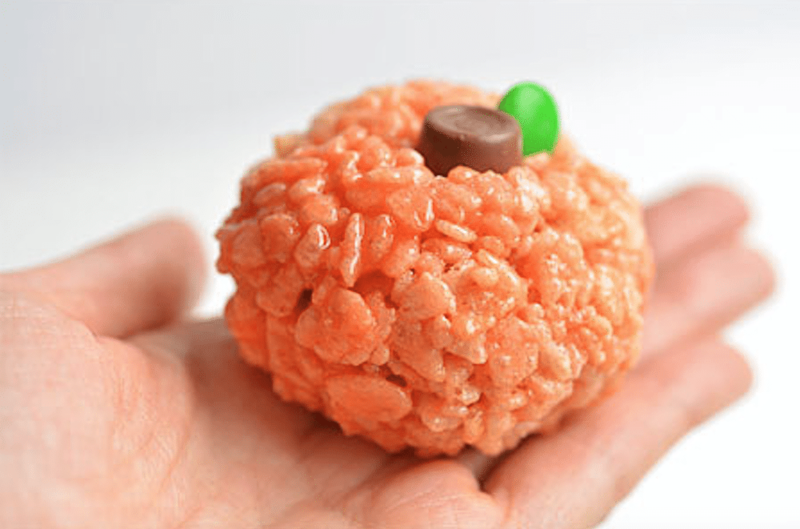 Using a small candy scoop or tablespoon, scoop out dough and roll into balls. Place on a cookie sheet lined with wax or parchment paper. Chill cookie dough balls until you are ready to dip them. Follow the instructions on the candy coating to melt it. Drop each cookie dough ball individually into melted candy coating. Using a spoon, gently spoon coating over the entire ball. Scoop out the covered ball and place on the wax paper. Repeat with each ball. Chill the cookie dough balls for 15­-20 minutes to let the coating set. Using a spoon and a back and forth motion, create lines across the truffle balls. This will give the ball a bandaged mummy appearance. To view Catch My Party’s post, click here. Take two black pipe cleaners, and cut them in half. Line up the four pipe cleaner pieces beside each other and center them as best you can. It’s okay if the lengths aren’t perfectly even – you can bend them afterwards to make up for it. Place the lolly pop on top of the pipe cleaners, about 1/3 of the way in from one side. 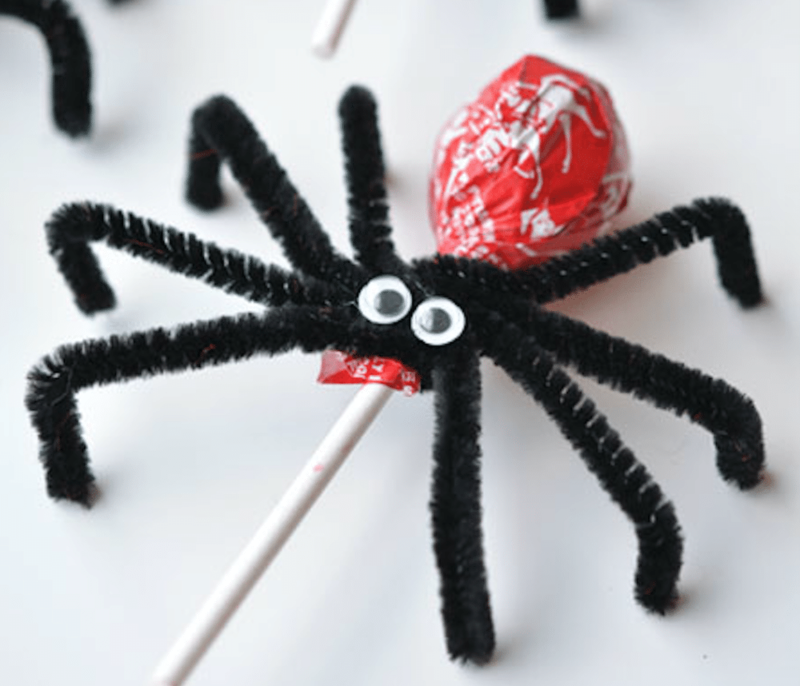 Wrap the long side around the lolly pop and loop it around. Pick which side you want the eyes to be on. Bend the legs into little L’s. They don’t have to be perfect, just do your best to shape them into little legs. Bend the pipe cleaners slightly sideways too so you have equal spacing between all the legs. Put a small dab of hot glue on the back side of the googly eyes. You can use white glue if you really need to, but hot glue works much better! It’s pretty much instant AND they won’t fall off. Place the eyes towards the front of the pipe cleaner spider’s body. You want the eyes about 1/3 of the way over the body. Not the middle. Not the edge. Just slightly back.